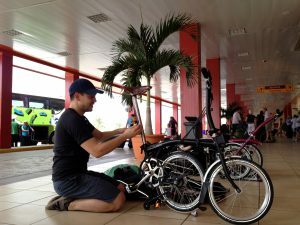 The first time we ever flew with our Bromptons was to Cuba, and we got a kick out of unfolding our bikes at the airport and just cycling to our destination. After all, in North America you can’t do that! Mainly because most every airport is surrounded by a maze of highways that are not safe and usually illegal to bike on. Not so in Cuba, nor in bike heaven Amsterdam. After some sleuthing in satellite view on Google maps, I discovered a bike route leading right from the Schiphol airport into Amsterdam. Perfect! So I set about trying to plan our route more thoroughly. 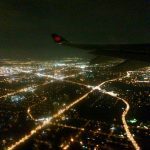 I’m not the type of person to just hop off an airplane and blindly find my way to a destination; however, buying detailed cycle maps of the Netherlands in Canada proved difficult. I’d have to have one shipped over here and it probably wouldn’t arrive before our departure date. So I turned to the Internet. Google maps shows some bike paths, but doesn’t really label them. Then I found this resource (http://www.hollandcyclingroutes.com/online-cycle-route-planner) and gleaned that cycle paths were EVERYWHERE and that following these step-by-step instructions would be tedious. 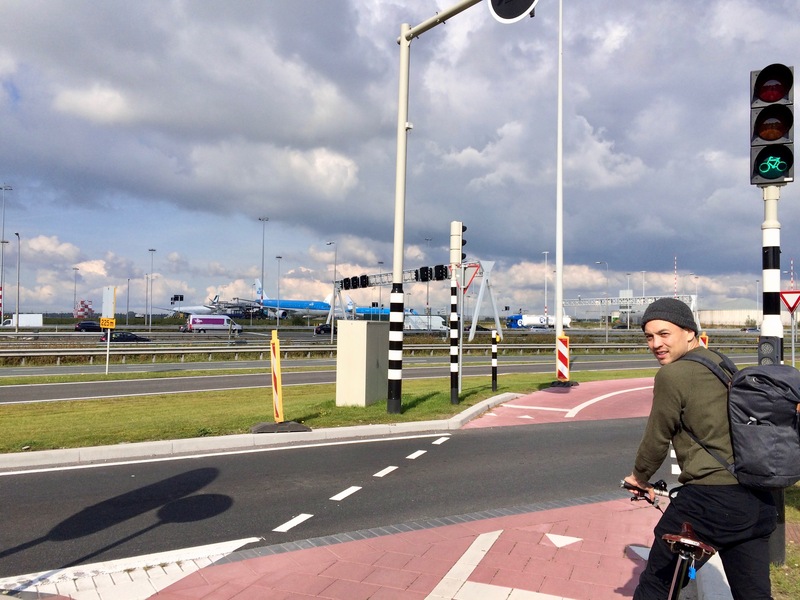 Besides, the most common advice online stated that cycling in The Netherlands was so easy — just “follow the signs!” At the very least, I could get a cycle map from the airport Tourist Information. So that’s what I resolved to do. We arrived in Amsterdam and headed to the TI. They had one cycling map, and it wasn’t the nice compact book kind I was hoping for; instead it was a monstrous thing that unfolded to the unwieldy size of a ten-person dining table. But better than nothing, right? Next, we exited the airport to figure out what street we were on and get our bearings on the map, and were met with what would be the biggest problem we had navigating this country — no street signs. We’ve been to Europe before and know that often street names are on plaques on the side of buildings, but this wasn’t the case outside the airport. There were simply no street signs. Period. Despite our monstrous map, we needed to ask for directions. We headed to the Sheraton and lo and behold on the other side is the cycle path. Success! Sorry for the bad picture, Pier, but we were both too jet-lagged to stand around getting better photos! Even more miraculous, there are signs! We followed the arrow “To Amsterdam”! And pushed the bike crossing buttons just like this guy. And then things went south. Literally. We were heading north-east, but somehow we ended up going south. I think that the road curved so slightly that we didn’t realize we were gradually changing direction. 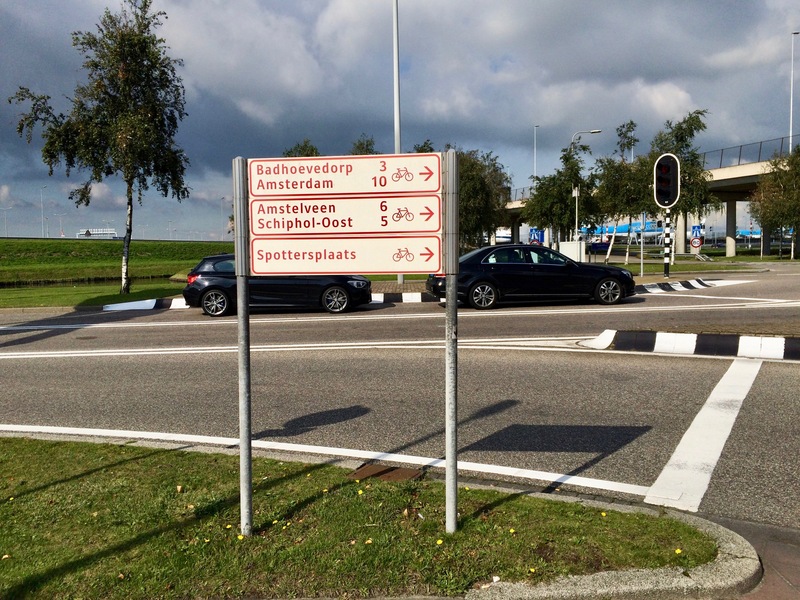 Worse, the next intersections we came to didn’t have any handy signs pointing to Amsterdam. The signs pointed other places, towns that we didn’t want to go to, but not Amsterdam. Worst of all, we didn’t know where the hell we were! Because, you guessed it, there were no street signs. Even at major intersections, the signs never named the streets, just pointed in the direction of towns many miles away. Not helpful! Finally, I located a tiny street sign for the road we were on, and a couple blocks later a sign for a cross street. 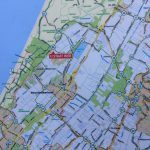 Time to pull out the map, search through the legend of thousands of street names (many of which are exactly the same except for a letter or two), and figure out where we were. We found the street on the giant paper map… but it couldn’t be right. We were so far south we weren’t in Amsterdam anymore. Then a guy came out of an auto body shop to help us and confirmed that yes, we were wayyyy south of where we wanted to be. He pointed us in the right direction and away we went. Eventually we made it to Amsterdam Central, but damn, it was NOT easy. So if you’re heading to Amsterdam and planning to bike from the airport to the city centre, here’s what you need to know. 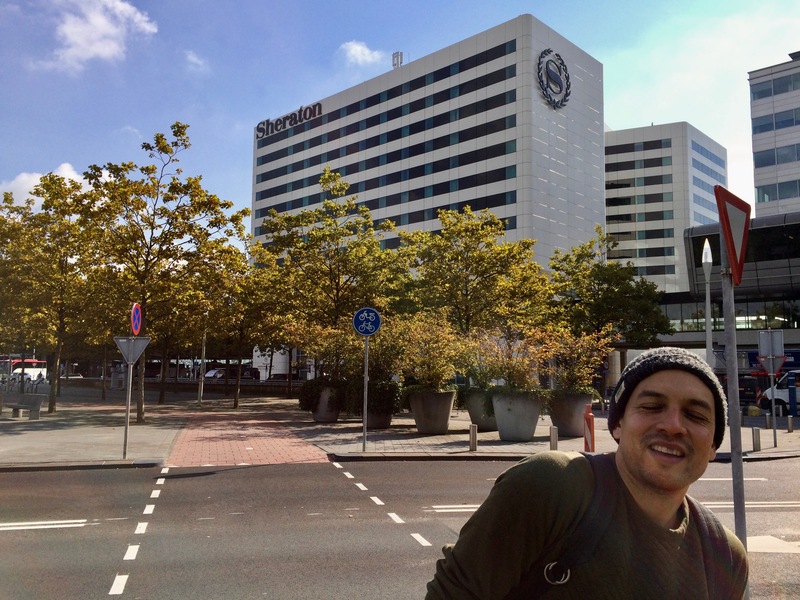 Exit the airport and find the Sheraton hotel. I suspect people will laugh at you less if you ask for that instead of the bike path. Get some data and use Google maps, or pre-download a map app like Ulmon’s CityMaps2Go. It doesn’t need wifi or data, just GPS (free! ), but make sure that your phone is not in airplane mode so that the app can access GPS and locate you. Also remember that GPS doesn’t always work inside, so go outside to get the app’s “find my location” feature working. Follow signs to “Amsterdam Centraal”. If you get to an intersection where there’s no sign like that, I hope you followed Tip #2 and can check where you are! If not, flag down a friendly Dutchman and ask for directions. I still can’t believe you were able to ride right out of the airport, every airport should have this feature!! Noted! I have a list of places to travel and I’m putting a star beside San Diego and Victoria BC as “airports to bike from”. Thanks for the info! The best one I’ve seen yet is Portland, Oregon – they even have a “bike reassembly area” on the way out (not that you need one with a Brompton, of course). Montreal and Paris are actually both very nice rides from the airport along tree-lined canals, but at both of them it’s a bit tricky to get out of the airport at first. In Montreal you have to find the secret tunnel that takes you under the train tracks and the autoroute – it’s part of the Dorval commuter rail station. Portland is definitely on our list of places to visit. A bike assembly area is so cool! 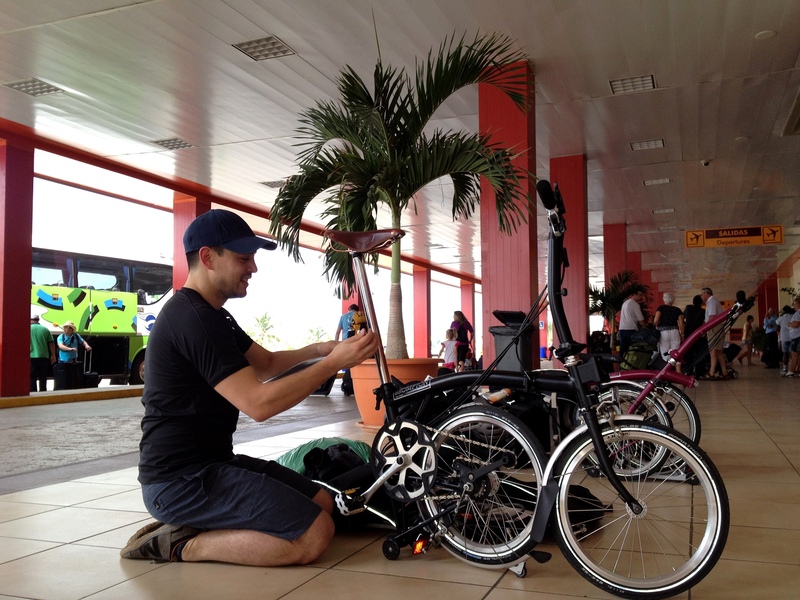 Even though the Bromptons don’t need assembly, I just want to see that. Thanks for the great airport tips! I did it as well. But it was easy with Komoot app. Tray it next time., it changed my biking live. For ex. I went from Prague to Strasburg never checking any map, just looking at my phone. Never lost.